Most discussion of web design in companies still naturally tends to focus on the home page. But, for companies who are running a lot of online marketing campaigns, the effectiveness of the different pages deeper within the site is vital to getting returns from these campaigns. So this prompts the question, which factors make for the most effective landing page? Is a ‘Perfect Landing Page’ possible? This post gives a summary of my top 12 and places to look to find more. If you’re into landing pages I recommend this excellent post written since I wrote this, decomposing 10 landing page examples. 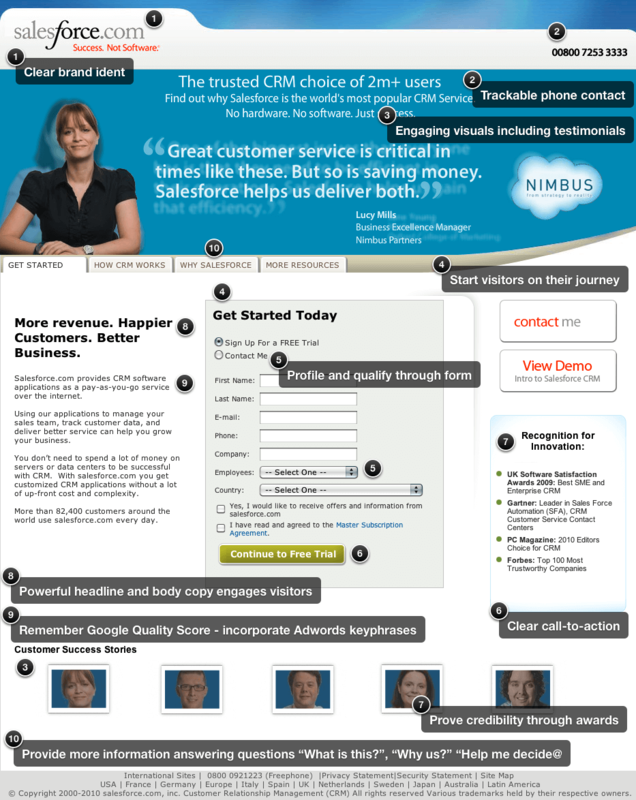 Salesforce.com – an example of the Perfect Landing Page? To illustrate these tips, I’m going to use an example I’ve used in training for a couple of years – it’s the Salesforce.com lead generation page for its CRM service (click to enlarge). I think it illustrates many good practices such as removing the main nav which can be a distraction. I’ve marked up what I see as good about this format. It’s maybe not perfect, but much better than most! Let me know what you don’t like about it! Or how things differ for consumer sites! If you want to read more on techniques to increase web site conversion I recommend my Web design best practice guide. This has many other tips and examples on landing page best practice. First, of all, what is a landing page or microsite? Not everyone knows this jargon and actually, there’s no simple answer. Anything referred to as a landing page is intended to maximise conversion of visitors to this page or series of pages to a particular marketing outcome – sale, lead or change in brand metrics. We have to bear in mind that there are different types of landing pages that work best depending on the campaign objectives and whether it is a short-term or long-term campaign. There are two basic choices. The first is a landing page integrated into the sites stucture and consistent with standard page templates and navigation for the site. The second is a landing page specifically created for the campaign with a different look and feel. Here are some of the pros and cons. It is most efficient in terms of effort in content creation to make landing pages part of the main site information architecture. The downside is that they may not work so well in terms of converting both direct referrers and browsers navigating from elsewhere on the site. They also need to be search optimised, which may add to costs of the campaign. This is an example of integrated pages for annual travel insurance (http://www.norwichunion.com/ travel-insurance/ annual-travel-insurance). So, companies need to work out whether the cost of producing this type of page is offset by the potentially higher conversion rates and better campaign results. Although this approach is surpisingly quite common, I think the approach is often taken for convenience eventhough it is more expensive in the longer term. I know of one E-commerce manager for a multi-national technology vendor who tries to educate their hundreds of web and traditional marketing specialists to not use the bespoke landing page approach, but to always try to integrate into existing site structure. Note that a landing page could potentially be the home page although this is not typically best practice. But, if a company has a limited range of products or the main campaign objective is to generate awareness rather than response. Since hitting the landing page is often the first experience of a company, we have to answer basic questions that the customer has about the company such as “Who are you?”, “What do you do?”, “Where are you?” “Do I trust you?” You may do these on the home page, but does the navigation on the landing page allow these questions to be answered. Standard menu options such as “About Us” or “Contact Us” can achieve these. TWO. INTEGRATE with referral source(s). The customer journey to your web site started elsewhere. To deliver relevance also requires consistency with what they have already read and seen to meet their expectation. THREE. Provide sufficient DETAIL to support the response decision. More generally, the whole experience needs to be right to generate response. For me, one of the most important aspect of landing pages, and one that is often not right, is that there isn’t enough detailed information on which the visitor can decide to signup. To help determine the right-level of information, best practice is to use design personas to identify typical information required and the gap relative to what you deliver. Also think about the level of “domain knowledge” the user has – do your technical product descriptions make sense. Also think about “tool knowledge” – where your landing page requires using additional tools what knowledge is required to use them effectively and are you providing the right explanations. FOUR. Start the user on their journey. The design should make the next step clear and minimise the number of clicks required for response since every extra click required in response will generally reduce response by 10%. It is best practice to include the initial data capture on the first page as shown in the Salesforce.com example. FIVE. Use the right PAGE LENGTH. This is a difficult one to give guidelines on. The right copy / page length is one that minimises the knowledge gap between what the user want to know and what you tell them. SIX. Use meaningful graphics. Graphics must be consistent with the campaign and generate empathy for the audience. Don’t understimate the importance of quality graphics – stock graphics rarely work. It is difficult to assess how graphics influence conversion rate, so the implication is test. SEVEN. Remove menu options? Another guideline that causes disagreement. Removing menu options will often increase conversion rate since less choice of where to click is offered, but for those who don’t respond will give a poor experience and prevent them browsing other parts of the site. Often a compromise is best with a reduction in menu options to top-level options only. EIGHT. Consider using a ‘flowable’ or liquid layout design This maximises real estate at a given resolution – Amazon do this, Orange don’t. So that’s my guidance, as always, tell me what you have found. Share the approaches you have found effective. Thanks.